The percentage of overdue B2B invoices in Hungary decreased in 2017. At 29.7%, the payment default rate in the country is far under the regional average. In 2017, Hungary’s economy is forecast to expand by 3.2%. While the country remains vulnerable to international investor sentiment and currency volatility, the positive outlook may have triggered Hungarian respondents’ increased use of credit terms with both their domestic and foreign B2B customers. After a sharp decrease in sales on credit terms in 2016, the total value of B2B sales on credit in Hungary increased again this year. With 65.5%, Hungary had the highest proportion of sales made on credit terms in Eastern Europe. On average, 62.1% of the sales to B2B domestic customers and 68.8% of the sales to B2B foreign customers was transacted on credit. Both these percentages show significant increases compared to 2016 levels (domestic: 54.7%; foreign: 52.5%). Among the Eastern European countries surveyed, only Hungarian respondents had a clear preference for selling on credit terms internationally. In Slovakia and the Czech Republic there seems to be a uniform perception of the risk of payment default between domestic and foreign B2B customers. A greater reluctance to offer credit to foreign than to domestic B2B customers was observed in Turkey and Poland. Compared to the averages for Eastern Europe overall (domestic: 42.7%; foreign: 37.9%), respondents in Hungary are far more open to granting credit terms to both their domestic and their foreign B2B customers. Compared to one year ago (36.2%), the percentage of overdue B2B invoices in Hungary decreased in 2017 to 29.7%. Moreover, the 2017 payment default rate recorded in the country is far under the average for Eastern Europe (41.5%). Respondents in Hungary (domestic: 75.2%; foreign: 57.8%) seem to have experienced late payments of B2B invoices less often than their peers in Eastern Europe (domestic: 88.5%; foreign: 78.9%). Hungary also had the lowest frequency of late payment reported in Eastern Europe. Overdue B2B invoices occurred more often with the domestic customers of our Hungarian respondents (35.6%) than with their foreign ones (23.7%); Eastern Europe showed a similar trend (domestic: 45.2%; foreign: 37.7%). The Days Sales Outstanding (DSO) figure in Hungary decreased from 53 days in 2016 to 37 days this year. This is the biggest decrease in Eastern Europe and may reflect increased efficiency in collecting high value invoices. In 2017, the difference between the country’s DSO and the regional average DSO (61 days) is of more than three weeks. Most Hungarian respondents surveyed (80.9%) do not expect a change in their annual DSO over the next 12 months. Only 13.4% expect a slight increase and 3.8% a slight decrease. Despite changes in average payment terms and payment delays in 2017, Hungary remains the Eastern European country with the shortest invoice to cash turnaround. Domestic and foreign B2B customers of respondents in Hungary were asked to settle their invoices, on average within 31 days after the invoice date. Compared to 2016 (domestic: 28 days; foreign 30 days), the average payment terms increased slightly and domestic B2B customers enjoyed payment terms just as long as foreign B2B customers. Despite longer average payment terms in 2017, on average, B2B customers of Hungarian suppliers had four days less to fulfil their payment obligations than B2B customers in the Eastern European countries surveyed overall. Respondents in Hungary reported changes in the average payment delays of their domestic and foreign B2B customers. 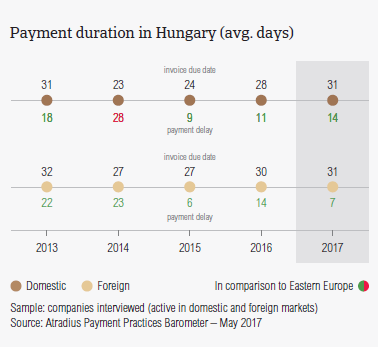 Domestic B2B customers of respondents in Hungary delayed payments, on average by 14 days (2016: 11 days). In contrast, foreign B2B customers delayed their payments, on average, seven days (2016: 14 days). Like in 2016, respondents in Hungary have to wait about 41 days to turn B2B receivables into cash. The percentages of Hungarian respondents stating liquidity constraints as the main reason for payment delays (domestic: 75.7%; foreign: 52.8%) are the highest in Eastern Europe and significantly higher than the regional averages (domestic 58.4%; foreign: 33.6%). Hungarian respondents said payment of invoices was delayed mainly because of insufficient availability of funds. Compared to last year (domestic: 75.7%; foreign: 65.7%), the percentage of respondents stating liquidity constraints in respect to their foreign B2B customers decreased by 13 percentage points. A second reason for payment delays was the buyers’ use of outstanding invoices as a form of financing (domestic: 11.2%; foreign: 24.5%). In comparison to 2016 (domestic: 14.9%, foreign: 8.6%), fewer Hungarian respondents stated this delay factor in regards to their domestic B2B customers and significantly more cited this about their foreign B2B customers. Both 2017 averages were under those stated in Eastern Europe overall (domestic: 32.4%; foreign: 27.7%). 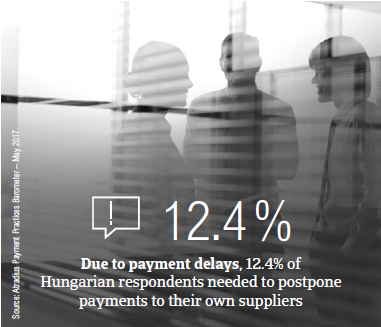 Most respondents in Hungary (83.7%) said that late payments did not have a significant impact on their businesses. However, 12.4% said that they needed to postpone payments to their own suppliers. Hungary seems to be one of the Eastern European countries least inclined to increase protection against risks stemming from Brexit, the slowdown in Asia and US protectionism. With 68.4%, Hungary had the highest percentage of respondents who stated that they will not change their current mix of credit management tools (Eastern Europe: 53.3%). Only 5.2% of Hungarian respondents stated their intention to increase protection. This is one of the lowest percentages in Eastern Europe and may highlight Hungarian respondents’ perception that they are not as exposed to risk arising from these developments. Similarly to what was expressed by respondents in the other Eastern European countries surveyed, Hungarian respondents are most likely to increase checks on their buyers’ creditworthiness (8.4%) and monitoring buyers’ credit risk more often (6.9%). Both these percentages are significantly under those cited at regional level (creditworthiness checks: 23.5%; buyers’ credit risk monitoring: 19.0%). Respondents in Hungary seem to be most concerned about the impact of US protectionism. In order to protect themselves from risks stemming from this event, 10.7% of respondents said they will increase creditworthiness checks while 8.2% said that they will monitor their buyers’ credit risk more often. 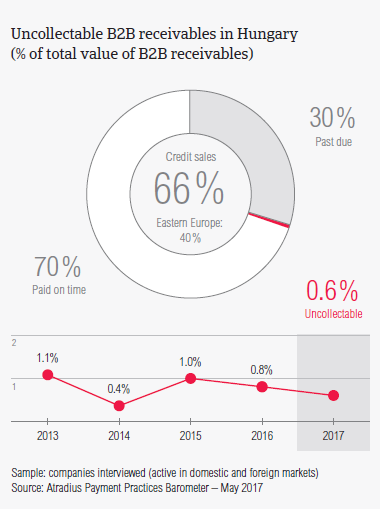 With 0.6%, Hungary had the second lowest percentage of uncollectable receivables in Eastern Europe after that of Slovakia (0.3%). Fewer receivables were written off as uncollectable in Hungary than in Eastern Europe overall (1.0%). The proportion of uncollectable B2B receivables in Hungary decreased slightly compared to last year (0.8%). Similarly to what was observed in previous surveys, uncollectable receivables in Hungary consisted almost entirely of domestic write offs (domestic: 0.5%; foreign: 0.1%). In 2017, the largest proportion of uncollectable receivables came from the agriculture, construction, food and services sectors. B2B receivables were uncollectable mainly because the customer went bankrupt (64.4%), the inability to locate the customer (33.9%) and failure of collection attempts (15.3%). Only 6.0% of Hungarian respondents said that they expect the payment behaviour of their B2B customers to worsen over the coming 12 months. This is significantly under the percentage of respondents who stated this in Eastern Europe (26.0%). Invoice payment terms extended by Hungarian respondents to their B2B customers in the machines (37 days) and transport (43 days) sectors were longer than the average payment terms observed in the country (31 days). At the other side of the scale, B2B customers in the electronics, paper and business services sectors (each with 25 days) were given significantly shorter payment terms to fulfil their payment obligations. The construction industry generated an above average (for the country) proportion of past due invoices. 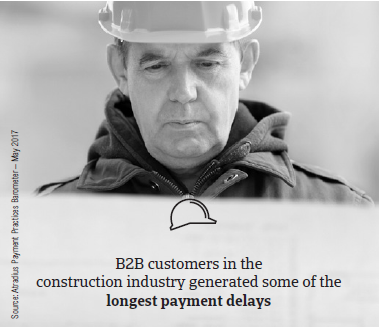 According to most of the respondents in Hungary (77%), slow payment from B2B customers in the construction industry is most often due to liquidity issues. Most respondents in Hungary (72%) said that they do not expect any changes in the payment behaviour of their B2B customers over the coming 12 months. Of those who expect a change, 22% foresee improvement while 6% anticipate an overall deterioration. After an increase of almost five percentage points in 2016, the percentage of overdue B2B invoices in Eastern Europe decreased again this year (41.5%). In 2016 non-food retail sales increased 6.8%, benefitting from robust private consumption growth fuelled by low inflation and increasing employment. 2017 is a major election year in Europe. Election gains of populist parties could undermine support for European cooperation and threaten reforms.